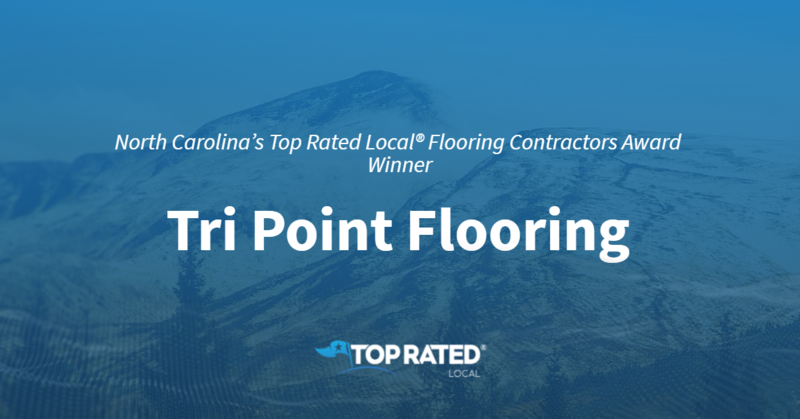 Top Rated Local® is pleased to announce that Tri Point Flooring is an award winner for flooring contractors in 2019. If you are looking for a flooring contractor that is known for excellent service and quality work, look no further than this award-winning company! Tri Point Flooring has received hundreds of overwhelmingly positive reviews across four different verified sites with an average rating of 4.72 stars, earning them an impressive Rating Score™ of 95.23 and a 2019 Top Rated Local award for ranking as one of the top 10 flooring contractors in North Carolina! “We thought customer service was dead until we met Roberto and his team at Tri-Point. From our first conversation, he was professional, reliable, and delivered the job on-budget and on-time. We had pre-finished hardwoods installed, and they are absolutely beautiful. The team was very diligent and careful. We would definitely use them again.” – H.R. It is because of excellent reviews like this that Tri Point Flooring is now able to call themselves a Top Rated Local award winner! We were excited to learn all about how Tri Point Flooring has been able to build such an impressive reputation, so we sat down with the owner, Roberto Rivera. Congratulations to Tri Point Flooring for being a 2019 Top Rated Local award winner, and special thanks to Roberto for taking the time to speak with us! 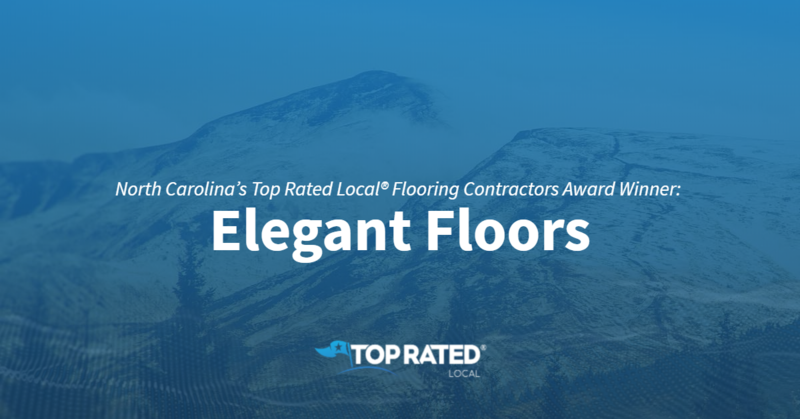 Top Rated Local® is pleased to announce that Elegant Floors is a 2019 award winner for flooring contractors in North Carolina! For all of your flooring needs, turn to the experts at Elegant Floors in Concord. 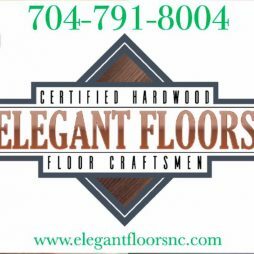 Elegant Floors has received dozens of reviews on five verified sites with an average rating of 4.95 stars, earning them a stupendous Rating Score™ of 99.46 and two 2019 Top Rated Local awards for being ranked among the top 100 businesses and the number one flooring contractor in all of North Carolina! “Darin was great to work with. He was so down to earth, very educated and thorough with his work, and the end results prove that. We would recommend Darin to anyone that is looking to get their floors done.” – Sherri D.
Darin Grines, the owner of Elegant Floors, generously gave us a few minutes of his time to tell us about his one-of-a-kind business and its stand-out online reputation. The first question we had for Darin was what sets Elegant Floors apart from their competition in North Carolina. Darin told us that they are certified in all wood flooring, that they provide the best customer satisfaction and that they always push to do what the customer wants. Darin attributes Elegant Floors’ strong online reputation to their commitment to always making sure the end result looks the way their customer wants it to and that the customer is happy before they leave. Outside of building a powerful online reputation, Elegant Floors has spread the word about who they are and what they do through Facebook and Google. Congratulations to the team at Elegant Floors for being a 2019 Top Rated Local award winner, and thank you so much, Darin, for taking the time to speak with us! We highly recommend Elegant Floors in Concord. Visit their website today! 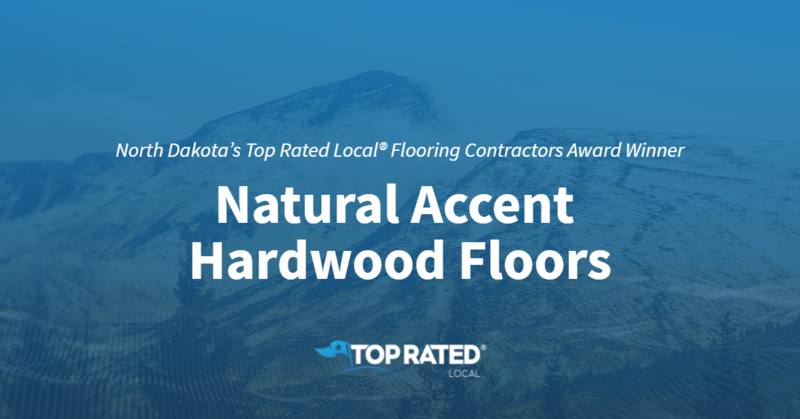 Top Rated Local® is pleased to announce that Natural Accent Hardwood Floors is a two-time 2019 award winner in North Dakota! Enhance your home with beautiful hardwood floors from Natural Accent Hardwood Floors in Fargo. Natural Accent Hardwood Floors has received dozens of reviews on four verified sites with an average rating of 4.98 stars, earning them a stellar Rating Score™ of 97.82 and two 2019 Top Rated Local awards for being ranked among the top 100 businesses and the number one flooring contractor in all of North Dakota! “Jim came by personally to assess 450 sq. ft. of bedrooms and hallway in our house. He gave us a number of refinishing options, which made it easy to decide on a path. He communicated well, and the crew finished on schedule. The floor looks fantastic, and they left absolutely zero dust behind.” – Nick H.
Jim Clarey, the owner of Natural Accent Hardwood Floors, generously gave us a few minutes of his time to tell us about his award-winning business and its wonderful online reputation. The first question we had for Jim was what sets Natural Accent Hardwood Floors apart from their competition in North Dakota. Jim told us that they are always thinking about the customer’s perception — that’s why they work hard to get them their bid as fast as possible and give customers as much information as possible. They text customers to let them know they are on their way. To them, over-communication is key. We also wanted to know what their mission is at Natural Accent Hardwood Floors. Jim told us that their goal is to be transparent, to never lead customers on and to provide honest communication and keep their word. Jim attributes Natural Accent Hardwood Floors’ strong online reputation to their commitment to always being upfront with their customers and never over-promising, as well as to providing what their customers need — even if a client is sold on something, they will work to inform them and talk them out of the purchase if they don’t believe the client will be happy with it in 10 years. Jim added that they offer their customers an incentive of $200 off if they leave a review on Google. Jim told us that, outside of building a powerful online reputation, he has tried a lot of different things to market Natural Accent Hardwood Floors and has had good luck advertising on and boosting posts on Facebook. Congratulations to the team at Natural Accent Hardwood Floors for being a 2019 Top Rated Local award winner, and thank you so much, Jim, for taking the time to speak with us! We highly recommend Natural Accent Hardwood Floors in Fargo. Visit their website today! 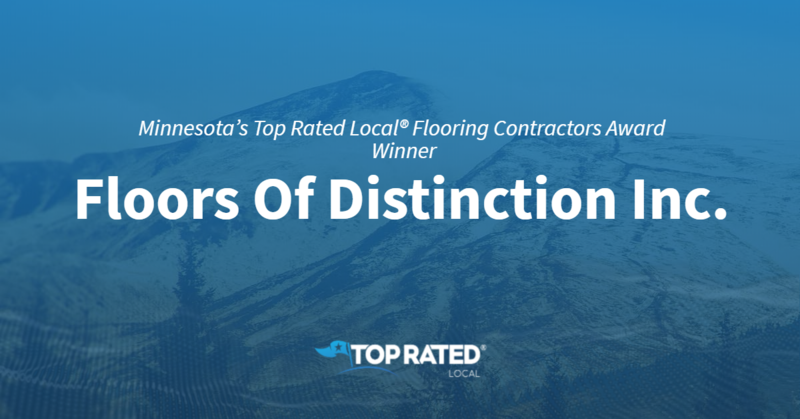 Minnesota’s Top Rated Local® Flooring Contractors Award Winner: Floors Of Distinction Inc.
Top Rated Local® is pleased to announce that Floors Of Distinction Inc. is an award winner for flooring contractors in 2019. For all of your flooring needs, look no further than this award-winning company! Floors Of Distinction Inc. has received many overwhelmingly positive reviews across four different verified sites with an average rating of 4.76 stars, earning them an impressive Rating Score™ of 95.62 and a 2019 Top Rated Local award for ranking as one of the top 10 flooring contractors in Minnesota! “We recently tackled the dreaded job of replacing carpet throughout the house. [They] were incredibly helpful with design options. They came out to my home to help narrow down the choices and provide feedback. The entire process was just seamless! [They also] did an amazing job on the installation. I couldn’t be happier with the outcome. I highly recommend FOD!” – T.L. It is because of excellent reviews like this that Floors Of Distinction Inc. is now able to call themselves a Top Rated Local award winner! We were excited to learn all about how Floors Of Distinction Inc. has been able to build such an impressive reputation, so we sat down with the owner, Christina Burns. Congratulations to Floors Of Distinction Inc. for being a 2019 Top Rated Local award winner, and special thanks to Christina for taking the time to speak with us! 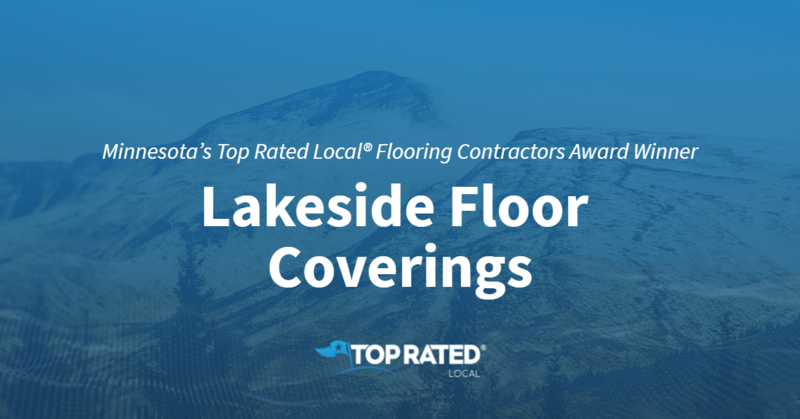 Top Rated Local® is pleased to announce that Lakeside Floor Coverings is a 2019 award winner! “Lakeside Floor Coverings installed hardwood flooring and carpeting in an older townhouse I purchased, and turned it into a beautiful home! They accurately estimated what it would cost, when they would do the work, and how long it would take. The results are stunning, with all the detail work I could want. 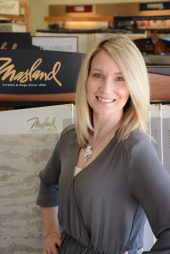 I highly recommend them.” -Stephanie O.
Keia Isaacson, the President of Lakeside Floor Coverings, took some time to speak with us about the business’ impressive online reputation. According to Keia, the Lakeside Floor Coverings mission is to be known as the flooring company that provides honest and quality flooring services. Congratulations to the team at Lakeside Floor Coverings for being a 2019 Top Rated Local award winner, and thank you so much, Keia, for taking the time to speak with us! 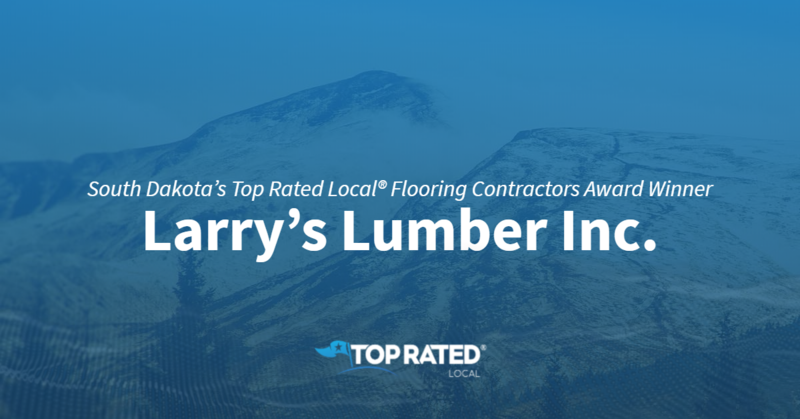 South Dakota’s Top Rated Local® Flooring Contractors Award Winner: Larry’s Lumber Inc.
Top Rated Local® is pleased to announce that Larry’s Lumber is the number one flooring contractor in the entire state of South Dakota! “[Larry’s Lumber offers] fantastic service and [a] great selection. [They have a] super knowledgeable staff with a great design sense.” -Suzanne S.
Jason Saxton, the Floor Covering Sales Manager at Larry’s Lumber, took some time to chat with us about the business’ awesome online reputation. Congratulations to the team at Larry’s Lumber for being a 2019 Top Rated Local award winner, and thank you so much, Jason, for taking the time to speak with us! We highly recommend Larry’s Lumber in South Dakota. Visit their website today! 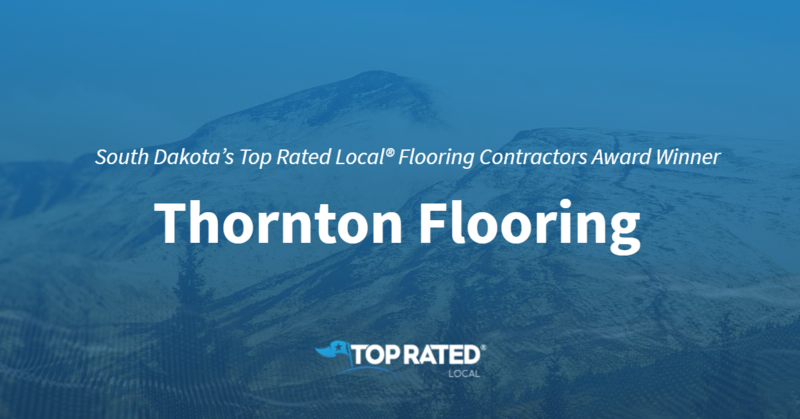 Top Rated Local® is pleased to announce that Thornton Flooring is an award winner for flooring contractors in 2019. For all of your flooring needs in Sioux Falls, look no further than this award-winning company! Thornton Flooring has received many overwhelmingly positive reviews across three different verified sites with an average rating of 4.66 stars, earning them an impressive Rating Score™ of 92.60 and a 2019 Top Rated Local award for ranking as one of the top five flooring contractors in South Dakota! “Thornton Carpets is the only carpet store that I trust to always receive the best quality, service, and the best prices for my clients. Being a builder in Sioux Falls, our clients look to us and trust us to use only the highest quality products in our homes, and Thornton Carpets is always here for us.” – F.J. It is because of excellent reviews like this that Thornton Flooring is now able to call themselves a Top Rated Local award winner! 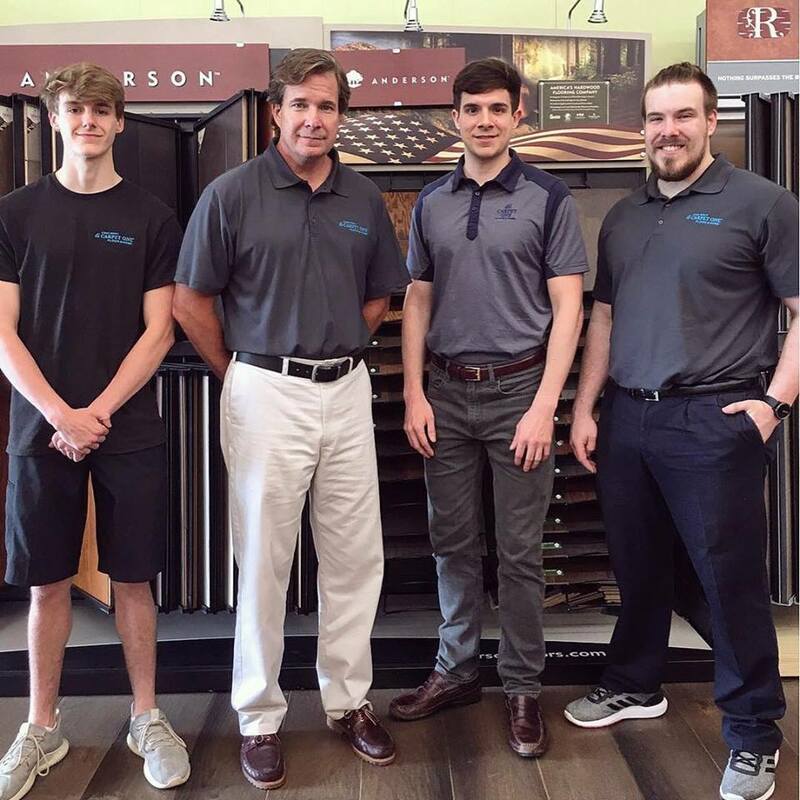 We were excited to learn all about how Thornton Flooring has been able to build such an impressive reputation, so we sat down with the owner, Matt Thornton. Thornton Flooring has certainly managed to build an impressive reputation online. We asked Matt what some of their marketing strategies were. He shared with us that they utilize SEO (search engine optimization), but that their true key to growth is to hire the right people for the right jobs. Matt hires people specifically for customer service related roles, which include greeting customers and performing post-job follow-ups. Their entire job is to make sure the customers are taken care of. Congratulations to Thornton Flooring for being a 2019 Top Rated Local award winner, and special thanks to Matt for taking the time to speak with us! Top Rated Local® is pleased to announce that Unique Wood Floors is an award winner for flooring contractors in 2019. If you are ready to have the best looking floors in Bloomington, Minnesota, you need to give Unique Wood Floors a call today! Unique Wood Floors has received many overwhelmingly positive reviews across four different verified sites with an average rating of 4.91 stars, earning them an impressive Rating Score™ of 98.06 and a 2019 Top Rated Local award for ranking as the number one flooring contractors in Minnesota! “My experience with Unique Wood Floors in Bloomington was nothing less than tremendous! Even though I had worked only a few blocks from their location, I was simply not aware of the business until a neighbor told me about them. I also saw his beautiful engineered wood floor and heard that their service and installation had been superb… I quickly paid a visit to Unique Wood Floors and was instantly taken care of. The entire process, from selection to measuring to installation, was ‘five-star.’ Unique Wood Floors is truly a unique company! They are fantastic. I could not be happier with my new wood floor!” – R.B. It is because of excellent reviews like this that Unique Wood Floors is now able to call themselves a Top Rated Local award winner! Whenever Unique Wood Floors has a customer who is not satisfied, they do their best to make things right. In addition to building their incredible online reputation through positive reviews, they utilize online Adwords, marketplace platforms, and social media platforms, like Facebook and Instagram. Unique Wood Floors has been family-owned and -operated for the last 16 years. They are currently working on a trade program to provide independent flooring installers and designers with a designated showroom and sales staff. 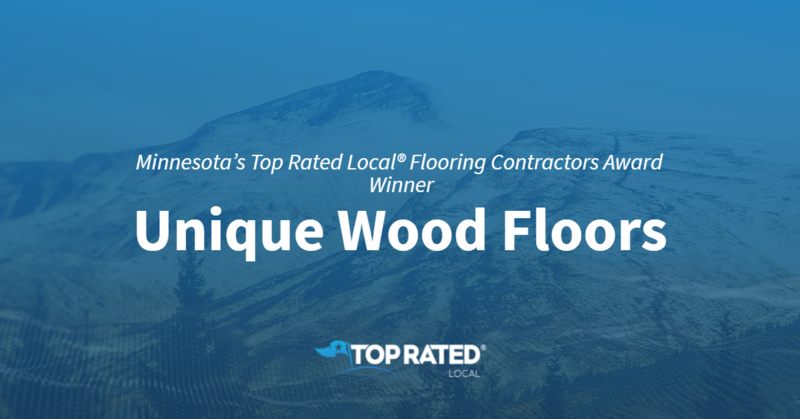 Congratulations to Unique Wood Floors for being a 2019 Top Rated Local award winner, and special thanks to Andrew for taking the time to speak with us! 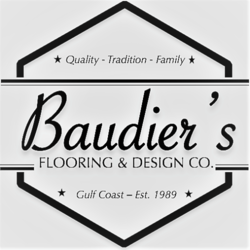 Top Rated Local® is pleased to announce that Baudier’s Flooring Inc is a 2019 award winner for flooring contractors in Mississippi! When you need a flooring contractor to do the job immaculately, we highly recommend going with Baudier’s Flooring Inc.
Baudier’s Flooring Inc has received dozens of reviews on verified sites with an average rating of 5.00 stars, earning them an incredible Rating Score™ of 95.00 and a 2019 Top Rated Local award for ranking among the top 10 flooring contractors in all of Mississippi! “I am immensely pleased with the sales staff and the craftspeople who installed my floors! I was on a tight timeline. The staff respected my goals AND my budget limits. Everything worked out as planned! My floors are handsome and easy to maintain. I will return to Baudier’s Flooring with my future projects, for sure! Thanks to all of you!” -M.D. We wanted to learn a little more about this award-winning business and its impressive online reputation, so we took a few minutes to talk with Debra and Michael Price, the owners at Baudier’s Flooring Inc.
Outside of building a powerful online reputation, Baudier’s Flooring Inc has gotten their name out there through Facebook, their website, and by some focus on social media. They also enjoy sending out Christmas cards to all their customers. Congratulations to the team at Baudier’s Flooring Inc for being a 2019 Top Rated Local award winner, and thank you so much, Debra and Michael, for taking the time to speak with us! Visit their website! Top Rated Local® is pleased to announce that Schneider Carpet One Floor & Home is a 2019 award winner for flooring contractors in Minnesota! Entrust your flooring needs to the best of the best by entrusting them to Schneider Carpet One Floor & Home in St. Paul. Schneider Carpet One Floor & Home has received dozens of reviews on three verified sites with an average rating of 4.81 stars, earning them an incredible Rating Score™ of 94.13 and a 2019 Top Rated Local award for ranking among the top 10 flooring contractors in all of Minnesota! “Schneider Carpet is the best. They went more than the extra mile to repair and refinish our hardwood floors and make them look beautiful. They even covered some cost themselves when they had to re-do their work due to some damage caused by a third party, not the fault of Schneider. [They were] so great to work with; the crew was prompt and thorough in their work, and their service was outstanding. I highly recommend Schneider for any floor work that needs to be done.” – Joyce F.
Patrick Schneider, the owner of Schneider Carpet One Floor & Home, generously gave us a few minutes of his time to tell us about his award-winning business and its outstanding online reputation. Patrick went on to talk about Spot Bomb, a stain remover created by Schneider Carpet One Floor & Home that you can buy online with a money back guarantee. Congratulations to the team at Schneider Carpet One Floor & Home for being a 2019 Top Rated Local award winner, and thank you so much, Patrick, for taking the time to speak with us! We highly recommend Schneider Carpet One Floor & Home in St. Paul. Visit their website today!